It's a great pleasure to be here at the University of Southampton. Today is a special occasion for me on two counts. First, we will be unveiling Britain's 15th Confucius Institute. Second, this is the ninth Russell Group university I've visited. 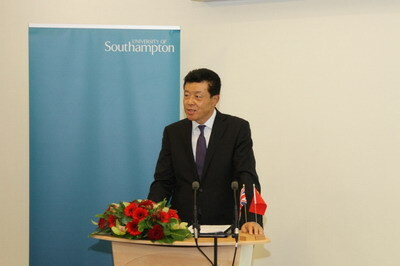 I want to extend my warmest congratulations to the University of Southampton and Xiamen University. I wish you a most productive partnership. 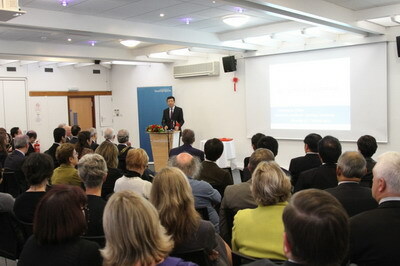 As we are about to open a Confucius Institute, it is appropriate to reflect on and talk about Confucius. As you know Confucius was the best known educator, thinker and statesman in ancient China. So, first what did he say as an educator? Confucius believes that teaching methods must be tailored to individual needs. The Confucius Institute in the University of Southampton has an important mission of teaching British young people Mandarin. It also means devising the right teaching methodology. "Isn't it a pleasure to review and practice what you have learnt". "The learning process is most rewarding when there's immense interest in it". These are clear indications that what Confucius found important is to make teaching and learning an interesting and pleasant experience. I hope the Southampton University Confucius Institute will take inspiration from Confucius. If that is done I feel sure this will encourage students' interest and make the learning process a pleasure and delight. My second point is about Confucius as a great thinker. Much of the thinking and philosophy of Confucius represents the best of Chinese culture. In China Confucius has been a profound influence for over two thousand years. China as a country has always been open to new ideas and cultures from the outside world. As you may know, there have been enormous changes and development in China. However, the values of the Chinese people are still in large part shaped by the Confucian heritage. Confucius stressed the values of love, justice, courtesy, wisdom and credibility. These ethics are central to the Confucian system of morality. These principles are as strong today as they have been for the past two millennia. Reflecting on this legacy of thinking, the biggest contribution this Confucius Institute can make is to not only teach Mandarin, but also introduce to students the Chinese culture and philosophy. Following this path will make your Institute a treasure house of Chinese language and culture. It will create a bridge that encourages communication and understanding in the University of Southampton and far beyond. The third point about Confucius I would like to talk about is his role as a statesman. In this capacity Confucius strove to build a world of harmony, where nations thrive in peace and gain from cooperation. Building on this vision, China today takes a path of peaceful development and pursues a win-win opening-up strategy. 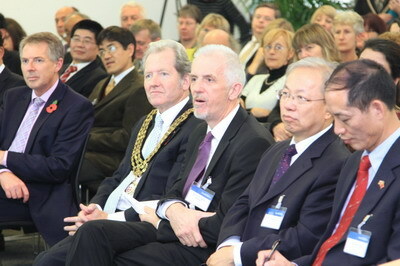 China is committed to working with Britain and the world to achieve development and mutual benefit for all. Our aim is to make our world a better and harmonious place. I'm confident the teachers of the Confucius Institute will do an excellent job to teach Mandarin and promote Chinese culture. More important, I look to you to act as ambassadors of friendship. You need to gain understanding and support for China's aspirations for a better future. I urge you to do your utmost to build understanding of China's commitment to peaceful development. These efforts are essential for the China-UK friendship to flourish. Let me conclude with congratulations again to the University of Southampton and Xiamen University on the opening of the Confucius Institute.